Potato bread recipe as traditionally enjoyed in Finland. This tasty, soft bread is best enjoyed just out of the oven and with butter on top. Cheap, easy and healthy bread, low-grain and wheat-free. 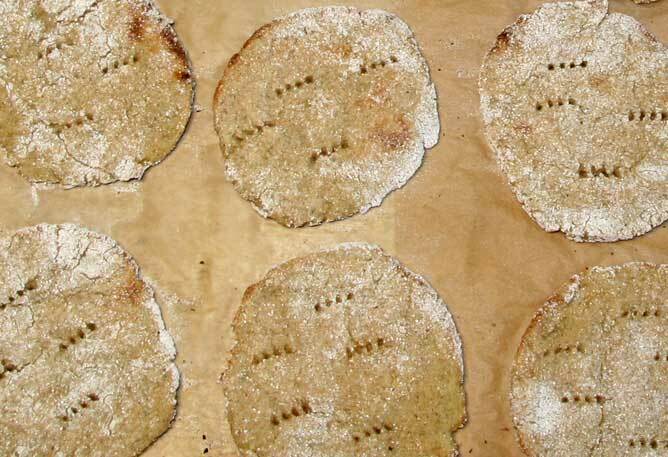 Traditionally barley flour is used but you can also use a mixture of gluten-free flours of your choice. The potato in the bread makes the texture very soft and a little moist. Barley flour: 4dl (1.7 cups) - Can be replaced by a mix of gluten-free flours. Boil the peeled potatoes in 5dl of water. Do not drain. 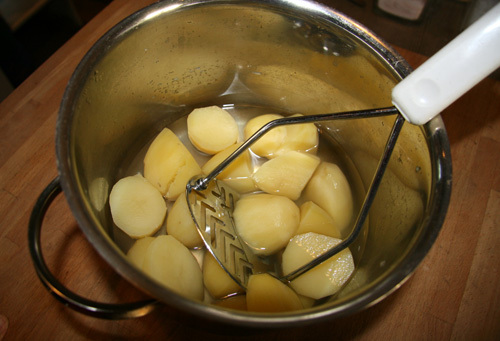 Add salt after boiling and use a potato masher to make potato and boiling water into mash. 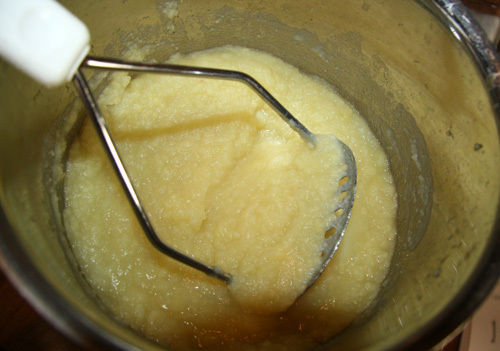 Let the potato mash cool down completely before mixing in the barley flour. Then work the dough until evenly mixed. Take a heaped tablespoon of dough and pat it into a flat, round shape, using flour as needed. Each piece of bread should be about 4" (10cm) in diameter. Don't use too much flour or the bread will become too dry. Lift the ready bread onto a baking tray (covered in ovenproof paper). Repeat until all the pieces of bread are ready for the oven. Use a fork to make holes to the bread pieces just before putting in the oven. Bake each bread tray for 10-15 mins. You may have to adjust the timing because each oven is different. Enjoy your potato bread straight out of the oven with butter! Mash boiled potatoes with a potato masher with boiling water. Potato mash can be quite watery. Keep the consistency of dough quite moist throughout to ensure that the bread comes out soft and moist after baking and not too dry. You may have to experiment to get the consistency of the bread just right. 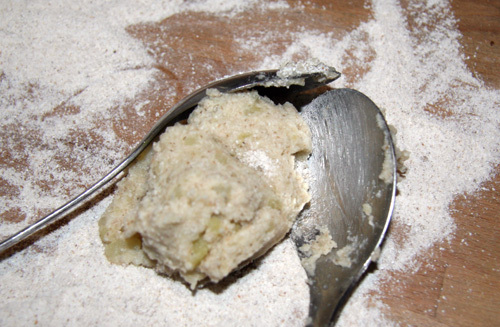 Too much flour will result in too dry bread, and too little flour may leave the bread brittle after baking. Err on the side of less flour, however. This bread can easily be enjoyed dairy-free as well, just use your choice of spread on top. Note that salt is to be added only after boiling the potatoes, as boiling anything with salt will increase acidity. Not only does it taste better to make flat bread with potato, but it is also more nutritious than using just flour, because potatoes as an ingredient are more fresh and nutritious than processed flour from a pack. Make a large quantity of potato bread at once and freeze. Can be quickly toasted straight out of the freezer anytime you need a snack. This traditional Finnish potato bread recipe was provided to me by my mum. It has been tried and tested for decades and the whole family has fallen in love with it.